By Emma Blades, Meteorologist Tropical depression TD03F was upgraded to a category one cyclone yesterday evening and named Tropical Cyclone (TC) Tuni by the Fiji Met Service. 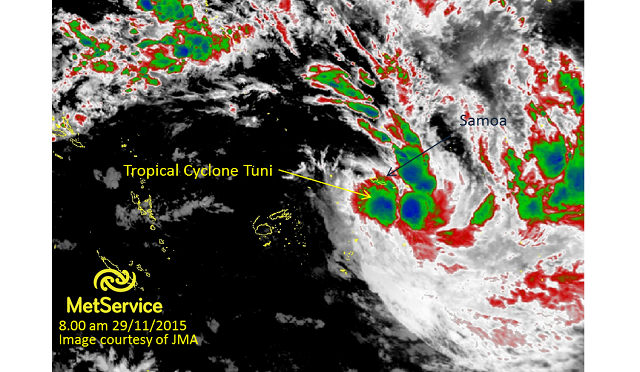 On Saturday evening TC Tuni passed to the southwest of Samoa. Radio New Zealand reported that Samoa had been battered by torrential rain on Saturday evening with reports of flash flooding across the island of Savai’i. At 7.00am this morning (New Zealand local time), TC Tuni had a central pressure of 993hPa and was positioned 160km southwest of Samoa. Winds close to the centre are estimated to be a sustained 75kph (40 knots) with gales extending 140km from the centre. 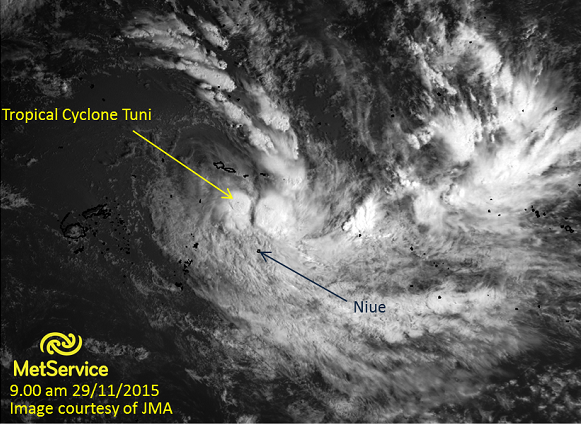 The image below shows the location of TC Tuni at 8.00am this morning. Infrared satellite image at 8.00am 29 November 2015 courtesy of JMA. Higher cloud tops are blue and green indicating areas of heaviest rainfall. You can see on the tropical cyclone forecast track map below that TC Tuni is expected to maintain its intensity as it tracks southeast over the next few days. It is not expected to impact on New Zealand at this time. However, it may pass very close to Niue on Monday/Tuesday and MetService will continue to monitor the progression of TC Tuni with our colleagues at the Fiji Met Service. The tropical cyclone season in the Southwest Pacific starts on 1 November, and usually peaks around January/February time. The formation of a tropical cyclone at this time of year is not unusual. With El Nino conditions this year we are expecting to have more tropical cyclones forming than in non-El Nino years.